* For the look of fine jewelry, we recommend our magnificent replica of a diamond and platinum marcasite bracelet featuring delicate inlaid Cubic Zirconia stones and lustrous silver rhodium. * This wholesale bridal bracelet will enhance any wedding gown and can also be worn for any special occasion. * With its look of real, it can even be worn every day. * This 7" bracelet is 1/4" wide and has the same safety clasp used on diamond jewelry. 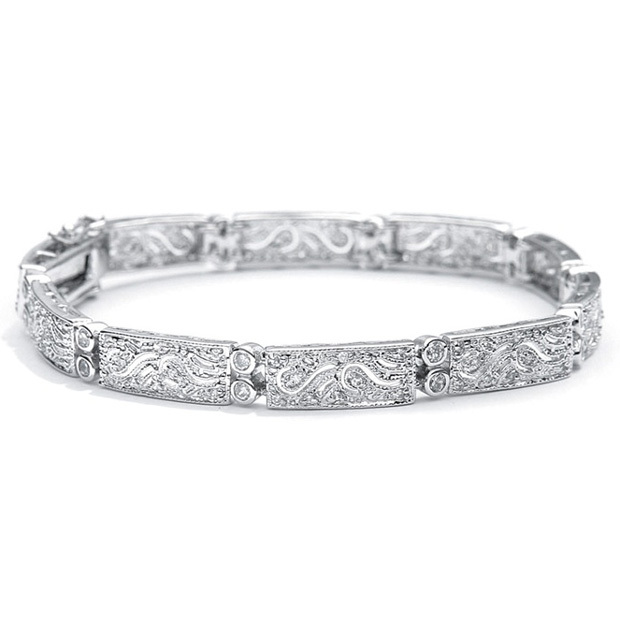 * Mariell's wholesale bridal bracelet is a replica of a platinum marcasite bracelet with delicate inlaid CZ's and lustrous rhodium to enhance any wedding.